As soon as I saw these guys, I wanted to see if I could mimic something close. I've done some previous Pre-Hersy style armour before, but nothing this complex. I wanted to see if I could take what I'd done before and expand on it to get something that would be passable for Cataphractii terminators. Let me back up a second and say that this guy is more of a test model to see if it could be done in the first place. He's got some really rough edges and could definitely use some more work overall. But... the idea is there and with some refining, this could produce a fairly respectable conversion I think. So let's look at what I did and what can be improved. This guy has had a few things done to him. From truescaling him up slightly (truescale tutorial can be found here) to bulking out his legs and then adding about a million extra rivets. I took what I saw as some of the key elements and tried to incorporate them into my conversion. Starting at the top and working down, I removed the sensor array attached to the head piece. Far too advanced for this MK armour. The chest piece would not normally be sporting the eagle either. If I were to make an adjustment here, that would be shaved off and some basic trim and rivets would be added in its place. I opted to go with a bare head since I did not have a suitable MK helmet I could use. I know they are out there as thrid party bits, I just didn't have one on hand. I suspect with a bit of filing away, you could get it to fit in the collar opening without too much trouble. I added the neck armour but kept it simple and brought it straight across. The addition of a few rivets tie it in with everything else. An improvement would be to add some trim and match that up with the trim on the chest armour. Nothing was done to the arms other than to change the shoulderpads. Instead of making my own, I cheated and used some from Maxmini that I had lying around. I could have made my own, but I was in a converting frenzy and went with what I had. I like these shoulderpads and buying them instead of making them can save you a good bit of time overall. The only downside is that you have to pick from the styles they have (of course that's true for any company out there). One issue I did run into with these was how they fit over the arms, I had to shave the shoulders down slightly in order to get the shoulderpads to fit correctly. Not a big deal, but not a hassle you want to deal with. I added small leather straps using cardstock from under each shoulderpad and attached rivets to the ends. The tight fit of the shoulderpads made it tough to get the straps up under there and I spent some time fiddling with them to get them in place. Like I mentioned, the torso has been extended by 2mm as well. I absolutely love that little conversion. The legs or at least the upper portion (thighs) have been bulked out. This proved to be a little bit of a challenge, but not as hard as I thought it was going to be overall. I had to cut away the side hip plates and I added a giant blob of greenstuff that I worked around the thigh. I tried to keep any rough areas on the inside where they wouldn't be seen as easily. The hardest part was getting the little tab that extends upward. I had to push the blob of greenstuff up and let it cure in place before cutting away the shape after it cured. This little tab piece is not that big of a deal in the end since his arms block most of that area anyway, BUT it does help tremendously with bulking out his waistline and keeping the model looking "correct." I think the bigger thing here is getting rid of the hip plates and bulking out the overall thighs. That one change alone makes a huge difference in the final look of the model. I gave him a leather strap half tabard which was super easy to do and I'll be covering in another tutorial. It's silly how easy it is to make one. I added some rivets to the bottom of the straps as well. 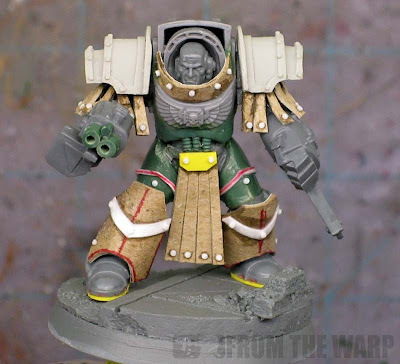 The half tabard does two things for the model, bulks him out, and even more importantly, hides some imperfections which is great on projects like this. The lower portion of the legs have had additional armour plates added to them to give them a different shape. I had to clean off some iconography already on the legs, but that was no big deal. I think an improvement here would be to use plasticard instead of cardstock for a smooth surface and prevent the splitting seen along the edge of the cardstock. That and adding a bit more detail to the surface of the armour with one more band of trim. The trick is to make it look convincing by adding enough detail. I could even match the style of trim up with the chest plate so the design flows down the model. The feet have had a thin spacer added to them to give the model a tiny bit more height overall. I like this small touch and may start including it on all my termies. It makes their boots look a little more heavy duty. Overall, I'm going to call this guy a successful test model. There are a number of things I can improve on, but the idea is solid and it can be executed. Now it's time to paint him up. I think I'm go paint him up as a Sons of Horus like Forge World did with their squad. Looking forward to seeing him painted. Great effort in converting him, can't wait to see it all tied together with one of your awesome paintjobs. 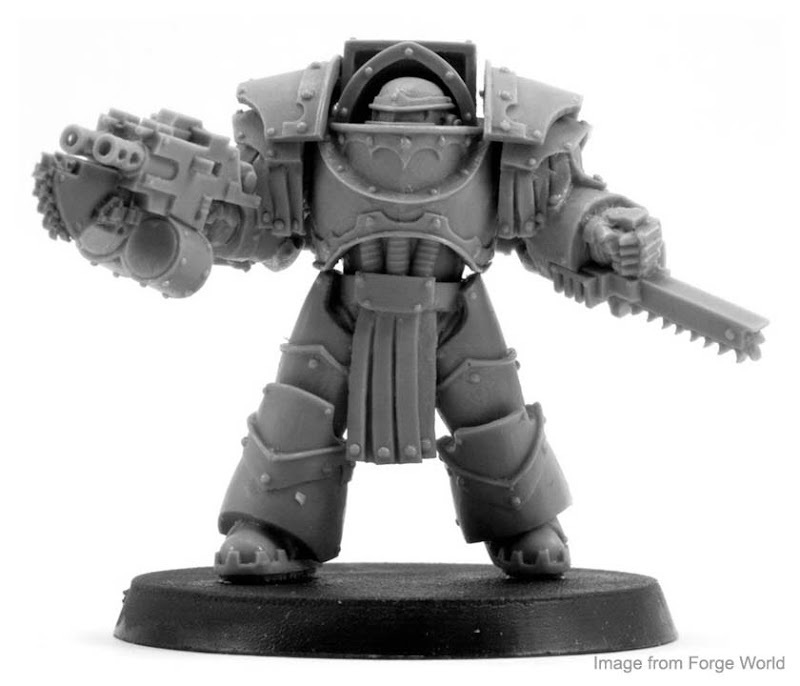 Ron, it is a nice conversion, but you have to admit that the Forgeworld price is quite reasonable. For 53 dollars I can get the bare cataphratii termies and then can choose some of thier weapon options. The standard GW termies will cost 50 dollars from GW. So I think if You have a bunch of terminators lying around this can be a fun project, but if I was starting a new heresey era army, I might just go for the forgeworld ones. Unfortunately, weapon selection(s) are sold separately at approximately 18.00-24.00 dollars depending on the set. When all is said and done, that is approximately 71-77.00 dollars for a five-man Cataphratii squad. Ouch. Nice conversion, Ron. As beautiful as the Forge World sculpts are (I'm a huge fan boy of FW), Your Cataphractii has a lot of unique character. The basic weapon loadout doesn't come with the models? What an awesome post, Ron! And a great test model to boot! Great job! Anyway, stuff like this is why I'm in the hobby in the first place, so keep it up! hey ron what do you use for your studs/rivets, they look great and uniform in size. dwez: Thanks! I'm excited to see how he paints up as well to be honest. Spyrle: An excellent point. There is that certain point when converting something costs more than just buying it. It's different for each project, but it's definitely worht keeping in mind. Glad you brought it up. Krautscientist: Very nice work there. And the asmount of work is not as important as what you come up with in the end. It comes down to using what you have and it looks like you've got it there. I think if you had the money and wanted the unit, the FW models would be the way to go... if you had regular ones and wanted the look... it's possible. Anon: I use a very, very thin plasticard rod and cut tiny cross sections off and superglue them in place. Did you "treat" the cardstock in any way? I recall from one of your previous posts that you used liquid superglue (as apposed to the gel) to coat the cardstock to make it stiff. Overall I think the model looks great. The (3) cables in the midsection sell the heightening of the termie. I also like the base. Source? The base comes from Secret Weapon Minis. It's one of my all time favorite lines. It's called Urban Streets. I love looking at what you used to convert and then comparing it to the finished mini. Looking forward to the painted update. Hey Ron that's looks great, a little too involved for me (im just way to lazy lol) but wow. 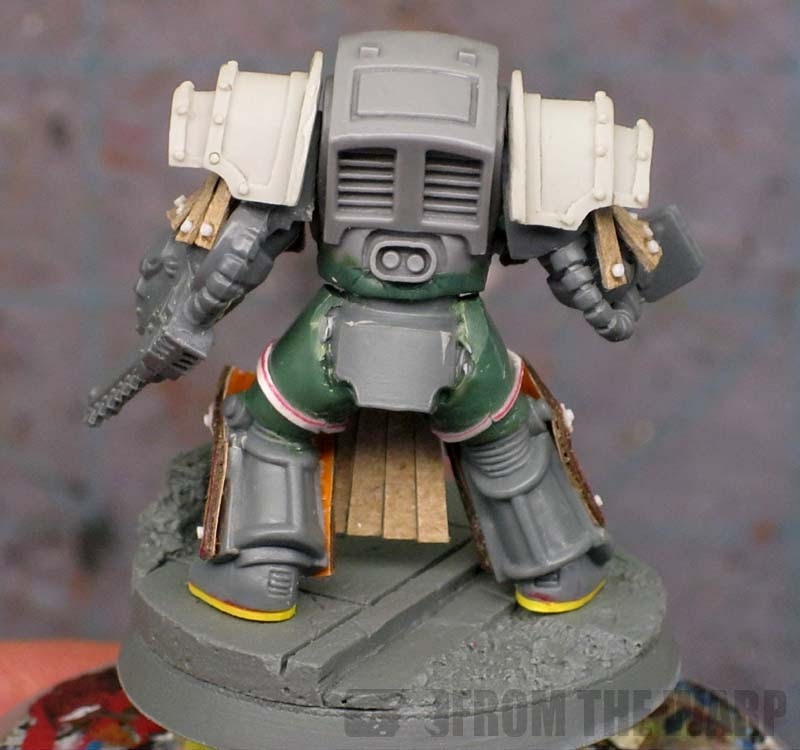 oh and please please please paint him up as pre heresy death guard, that scheme just looks amazing. Jason Gross: Nope, I wanted to see if I could do it more than I was trying to do it perfectly. If I were to build another one, I would consider using plasticard so the surface would be nice and smooth. dancing platypuss: I see what you mean. That might be tough to change though. james fenton: I'm going Sons of Horus using the darker green scheme that FW used. I want to see if I can get something similar. mmm maybe is the " hole" between the two parts wht look weird to me... have u thought of filling it? I hadn't thought of that. To be honest, I skipped over that portion of the model entirely when I was building mine. Like the back, I know there are more changes I could make, but I didn't apply them to this model. The trick is finding what "needs" to be changed so you get the effect and what you can skip without it detracting from the model overall. I've been thinking of doing this but seemed like a lot of work but you've made it look quite straight forward. Did you consider trying to copy the forgeworld style power units at the back? With some plasticard tube, greenstuff and guitar cable it looks do-able. I think I'll definitely be doing a couple of these, not a whole squad but a couple of relics used by veterans and maybe a hq. I saw the back and decided to focus more on the overall armour. The single biggest thing for me was trying to bulk out the upper legs. That's the one thing I wanted to see if I could do. I am constantly floored by your skills with GS, Ron - I absolutely love how this turned out. Keep up the fantastic work! Thanks! This guy was a big step for me in tackling the leg armour. I wasn't sure I had the ability to do it despite having a plan. Ron, as an alternative starting point you may want to look at the chaos terminators as they seem to have the appropriate moulding that is closer to that of the FW piece. Kaka: You're right, the gun should me modified to fit the time period, but this was more of an experiment to see if I could do just the amrour really. I wasn't even sure I could pull that off.